At our Church our pastors and teachers frequently tell us to “repeat after me” and then we say things like “God is my Father,” or “I can do anything through Christ,” and one of my favorites “I am the righteousness of Christ Jesus.” We confess God’s word and His plans for us at Church and at home. It is a way of life, it is common place for us so I don’t think about it too much. Then I brought someone to Church with me recently, who isn’t in the habit of going to Church, and afterward when I asked her what she thought, she mentioned the “repeat after me” thing. In her words “it was like brainwashing to me, I don’t like someone telling me what to say.” I quickly explained that to retain what you learn you need to hear it, read it, and write it (the same explanation of why I took notes during the message) and that by saying it out loud, it helps us even more to remember what we have learned. I don’t remember exactly what we repeated that day, maybe even a few things. It was either scripture or scriptural and uplifting, so I pondered that for a while. I thought, if we repeated something like “drink the Kool-Aid” or “kill the infidels” I would understand better the objection. Then I thought, people do that all the time in marketing seminars, self-help seminars, and feel good about yourself and life seminars. They repeat things like, “I am a winner,” “I can sell anything,” or “Nothing can stop me.” I don’t really have a problem with any of that. When I realized this didn’t bother me because it was positive thinking, it was to help and build up confidence, it suddenly dawned on me (or the Holy Spirit finally got through), it was brainwashing! 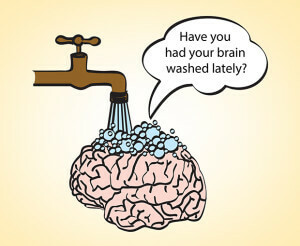 Now, I realize that a lot of bad brainwashing goes on. Just watch TV or any commercial. If we don’t have that new car, we haven’t arrived yet. If we don’t wear those clothes, we aren’t part of the in crowd. If we don’t drink that booze, we are so less than cool. We are brainwashed to believe that youth is the only type of beauty and then only if it is a size six with perfect skin, hair and nails, and teeth white enough to see from space. We are brainwashed into believing that the government can do a better job of raising our kids, and that a women that stays home to raise her own must be lazy. But, is all brainwashing bad? My answer I “NO!” If our minds get filled up with so much junk, bad words, bad images, bad attitudes, pure “crap” from the world, and lies from the enemy, shouldn’t we be washing that all out! Of course. Less you think that just repeating a few lines on Sunday is enough to brainwash you, think again. True brainwashing happens by repeated and continual exposer. So, repeat, read your Bible, and then do is all again. Daily. This entry was posted in Thoughts and tagged brainwashing, Christ, christian, Christianity, faith, freedom, God, God's love, God's word, help, mind control, Salvation, scripture. check this out . Купить чехлы на диваны artdeco.co.il.